Learn about using the Message Threat Policy to guard against XML-based denial of service attacks. The Message Threat Policy is used to guard against XML-based denial of service attacks. An attacker can construct XML messages in such a way that parsing them could result in overwhelming CPU and/or memory consumption. This policy can detect such situations and reject the messages immediately. Configure the policy by specifying acceptable parameters that will support your usual and expected traffic while protecting your system from attackers. Find the policy on the list and click to go to the pane for the Message Threat policy. In the second section, click Modify. The Modify Message Threat Policy page opens, as shown below. Specify values for the policy as needed. For information on the individual options, see Message Threat Policy Options below. 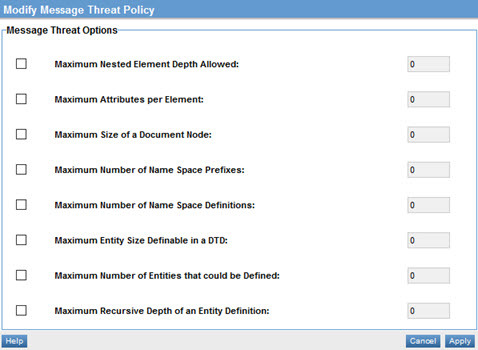 The Modify Message Threat Policy wizard has one page, Specify Message Threat Policy Options. It includes the options listed below. Maximum amount of nesting levels that the Message Threat Policy allows in messages. In the absence of this optional sub-assertion, services are not protected against a denial of service attack through too many nested elements. Maximum number of attributes allowed per element in messages. In the absence of this optional sub-assertion, services are not protected against a denial of service attack through too many nested elements. An attacker could nest XML elements to the depth of thousands, which would clog the memory and slow the processor. Maximum number of kilobytes that a single node in the XML DOM tree can use. In the absence of this optional sub-assertion, services are not protected against a denial of service attack through excessive node size. An attacker could overload an XML node with a huge amount of data. Maximum number of namespace prefixes allowed in the message. In the absence of this optional sub-assertion, services are not protected against a denial of service attack through having a very large number of namespace prefixes, meaning that an attacker could include hundreds or thousands of namespaces in a single XML message. Maximum number of namespace definitions allowed per message. In the absence of this optional sub-assertion, services are not protected against a denial of service attack through having an excessive number of namespace definitions, meaning that an attacker could overload an XML message with a huge number of namespace definitions. If a DTD is present (internal or external) and there are entities defined, this value limits the maximum size (number of chars) of any given entity. In the absence of this optional sub-assertion, services are not protected against a denial of service attack through DTD entity size that is too large, meaning that an attacker could overload an internal or external DTD entity with huge value in terms of number characters. If a DTD is present (internal or external) and there are entities defined, the maximum number of entities allowed per message. In the absence of this optional sub-assertion, services are not protected against a denial of service attack through having an excessive number of entities, meaning that an attacker could overload a message with a huge number of entities (millions). If a DTD is present (internal or external) and there are entities defined, the maximum depth allowed recursively. In the absence of this optional sub-assertion, services are not protected against a denial of service attack through too great a recursive depth of entities, meaning that an attacker could employ huge number of entities recursively defined with value of other entities. This could cause combinatorial explosion of entities.